First it was Stalactites, now Brunetti: I'm hitting the classic Melbourne destinations this week. The reasons have been a little different. With Stalactites, it was to introduce interstate friends to 24-hours-a-day-accessible Greek food in the city. With Brunetti, it was in order to find a cheap but varied lunch option, and to celebrate a friend's impending transition from Carltonian to Fitzroyite. I hadn't previously investigated the savoury offerings from Brunetti. It is rather difficult to get past the pastry counter, after all. But venture further and you are rewarded with a stocked display case of piadinas, sfogliati and tramezzini. When choosing sandwich filling, Brunetti knows their market and stick with Italian favourites: popular fillings include proscuitto, eggplant and parmesan. 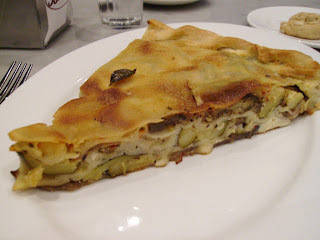 The sfogliati are similar to the Greek spanakopita: pastry sandwiches. A spinach and cheese option is available; however, I went with the melanzane, zucchini, mozzarella and feta ($8.80). The pastry isn't as flaky, or in as many layers, as on a spanakopita. The filling is simply delicious: each of the vegetables contributes strong flavour, so it has obviously been made with fresh ingredients. Cheese and pastry is always a wonderful combination and the mozzarella wraps everything in its gooey care and holds the whole together. The saltiness from the feta lingered a bit longer than I would have liked, though maybe only because I found it so enjoyable that I scoffed the whole slab.